Looking for a break from hectic work life, then the beaches of North Carolina are the best destinations to head this holiday season. Sandy white beaches, clear crystal waters and exotic aquatic life are just some of the features that make these beaches so welcoming. North Carolina's coastline stretches over 300 miles. Looking for a few moments of solicitude, take a trip down to Bald Head Island. It is a perfect getaway and an awesome destination to rejuvenate your energy. Situated just south of Camp Lejeune, Topsail Island is the best place to indulge in kayaking, fishing, swimming or enjoying a day out with family and friends. Whether you are looking for a boardwalk which comes with exciting amenities such as hot dog vendors, ice cream shops and carnivals or for just watching the lovely crystal clear waters, then Carolina Beach is the best place to visit. 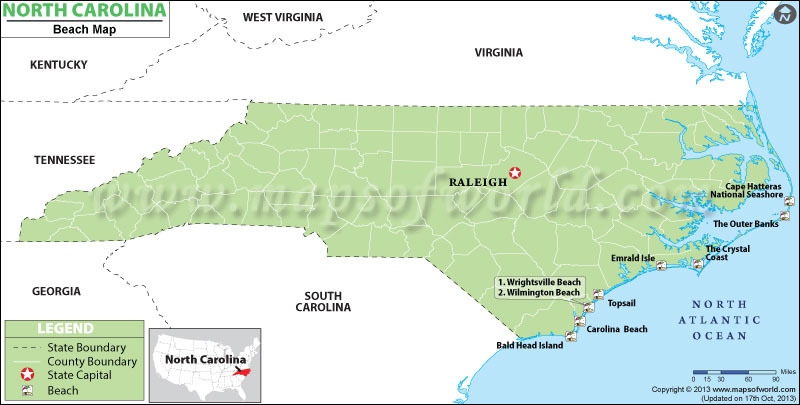 Along with these fantastic beaches many other important ones are marked on the North Carolina Beaches Map. Some other beaches shown on the map are Emerald Isle, The Crystal Coast, and the Outer Banks to name a few. Along with Raleigh, which is the capital of North Carolina, the map also depicts the neighboring states of Virginia, Georgia, Tennessee, South Carolina, West Virginia, and Kentucky.